View Poll Results: Shall Arachir be awarded Opifex? Shall Arachir Galudirithon be awarded Opifex? To qualify for the Opifex award, the nominee must have made exceptional contributions to modding or TW sections of the boards, either by modding or other contributions related to the those sections. 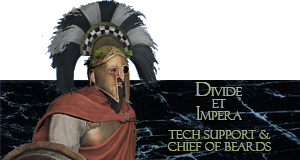 He is the current team leader of Divide and Conquer, a submod for Third Age: Total War. At the time of writing this, 2.88% of all online users (not members) are currently looking at the Mod Forum, which I find fairly impressive. Here are the various releases he has led, all massive posts with giant changelogs and a lot of work being done before DaC got its own subforum. Years passed, and DAC got a new subforum, just in time for a new realease. This is his 6th year of working on the mod, and shown immense dedication and activity on the way. Simply looking up his latest posts shows the amount of time he puts into this, and how much he supports the mod, but also the players, however simple it is. These are just a few random extracts, but they paint a picture of his polite attitude, answering questions and taking in feedback. I believe good interaction with the community is a very important aspect, which he covers. 1, 2,3,4, 5. These posts in themselves do not amount that much, but when they are just a few of many, it means more. He has given DaC a fresh face, and after the creation of the subforum several new versions have been released. The latest version is Version 3, which was released yesterday, on the third day of the third month of 2019. Quite an appropriate date for a third version if I might say so. Galu has, through his years of work won Most Popular Modder in the 2014, 2015, 2016 Medieval 2 Modding Awards, in addition to winning the runner up Favourite modder for Medieval 2 in the 2017 Awards. I have no doubts that he'll go far in 2018's. Training in the Den,with a massive pair of binoculars, surveying TWC, ensuring members are happy. "No problem can withstand the assault of sustained Dufferism"
He's a dedicated member of the modding brotherhood. Under patronage of General Brewster of the Imperial House of Hader.